Morning visit the town, famous for iconography and craftsmen producing Chola style bronzes. 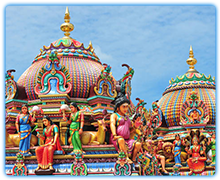 Visit the richly decorated temples at Darasuram and Kumbakonam. After breakfast drive to Tanjore, the cultural capital of the region, famous for Tajore School of painting. 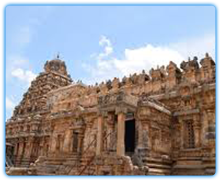 Visit the magnificent Brihadeeswara temple complex where you can also see 1000 year old paintings. After lunch drive to Trichy. Overnight at the Hotel. Trichy, the land of Three Headed Demon is a living example of a temple town. Early morning drive to Kaveri River to witness the Hindu rituals. Visit the magnificent Shrirangam island temple complex and the Rock Fort Temple. After lunch drive to Madurai. Overnight at the Hotel. Morning city tour visiting the Thirumalai Nayak Palace and Shree Meenakshi temple, an excellent example of Dravidian architecture. Afternoon at leisure. 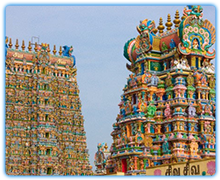 Evening return to Meenakshi temple and visit the colourful temple market. Drive to Thekkady. Afternoon game viewing by boat in the Periyar National Park, noted for its Elephant herds and a rich variety of bird life. Overnight at the Hotel. Early in the morning game viewing. Drive to Munnar, a hill resort in the midst of Cardamom and tea plantations. Munnar is a major centre for tea industry in Kerala. Afternoon explore the town. Overnight at the Hotel. Morning visit tea and spice plantations. Later drive to Cochin. Evening see the Kathakkali dance performance. Overnight at the Hotel. Morning tour of Cochin, known as the Venice of the East. Visit the Dutch Palace, Jewish Synagogue, Fort Cochin and St France’s Church. In the evening a Sunset harbour cruise to see the Bolgahtty Island and the Chinese fishing nets. 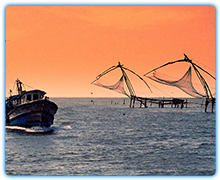 Drive to Allepy and take a boat to Kottayam. The cruise takes over 3 hours passing along most picturesque narrow canals and waterways. Drive to Mararikulam. Overnight at the Hotel. At leisure by the beach.